In the early 1990s I had mentioned that the key that music is played in and the tempo might well be related because tempo can be thought of as a very slow note. To understand this, Let us for simplicity assume that a piece of music is in the key of C and that the frequency of middle C is 256 Hz (cycles per second). Then as we go down by an octave at a time, successive Cs will have frequencies in Hz of 128, 64, 32, 16, 8, 4, 2, etc. Now 2 cycles per second is the same as 120 cycles per minute. It might be the case that a piece of music is intended to be produced at a tempo of 120 beats per minute. In that case we may say that the tempo is in the same key as the music. With harmonics theory I expect that after every two or three ratios of 2 (that is, moving down an octave) there might be a ratio of 3. So in that case the tempo would be 80 or 160 bpm (beats per minute). My own investigations of some great composers such as Mozart and Beethoven found that they very often did match up key and tempo. But not all composers do. One problem is that the tempo is often not specified accurately enough for our purpose. However I found that Billy Joel specified the tempo accurately and of course we have his recordings to check. He also matched tempo to key. By match I mean that the tempo is either a number of ratios of 2 slower than the key note frequency, or possibly with one ratio of 3 also. On reflection it is possible that a second ratio of 3 should also be allowed. Not long after I first mentioned this on internet, someone (I forget who. If it was you, please remind me) wrote to me saying something like “someone else has been thinking your thoughts”. They supplied a link to a web site by Stephen Jay and indeed he had been thinking very similar thoughts. He had gone a little further in identifying chords in the commonly used rhythms. Unfortunately after a while his web site disappeared. A couple of days ago I was thinking about this and remembered the Internet Archive or Wayback Machine which lets you see the internet as it was years ago. Putting in the old link I found the web page existed until the late 1990s. But then I did a search and found that Stephen Jay was mentioned in Wikipedia and had a Web Site which included the Original Article. Stephen Jay. Read his article on The Theory of Harmonic Rhythm. Actually there is a web site with a further two years data but it needs to be collated into the same form of daily totals before analysis can be done. 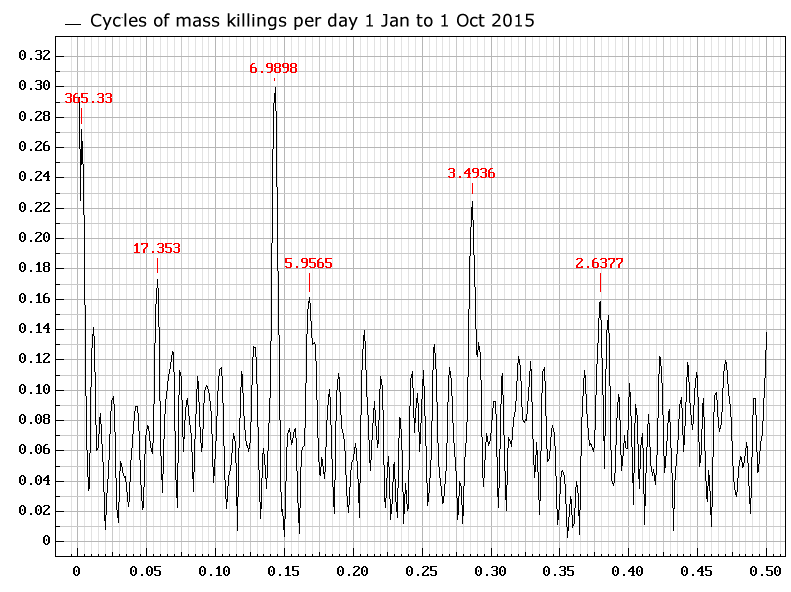 Are there cycles in mass shootings? What could cause variations in their occurrence? These questions were examined. This is a spectrum of cycles present in the above 9 months of data. Cycles periods in red are significant except the 365 day one. We may take the two most prominent cycles of 6.99 and 3.494 days as being a week and half a week. This is not surprising as people’s habits vary greatly by the day of the week. 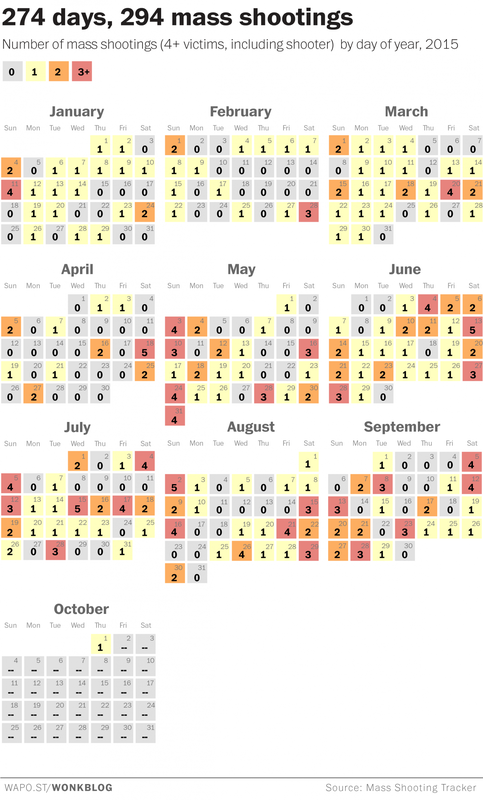 Further analysis shows that there is little difference between the five week days, but compared to them Saturday has 100% more mass shootings and Sunday has 140% more. It reminds me of the old saying “the devil finds work for idle hands”. As there is only 9 months data, we cannot say that there is a 365 day cycle but it seems quite likely, as seasonal weather patterns play out. There are more killings in the summer months. The other three cycles of 17.35, 5.96 and 2.64 days do not seems to be related to any commonly know cycles. Combining the above cycles to see how they fit the original data also allows a possible projection. Ideally a longer base period would be used for this, but we can look and see whether or not the future follows the past patterns. Sadly, we can expect many more mass killings in the future. The original data and explanations are available here as well as further data going back several years. One of my absolute favourite Cycles Researchers was Alexander Chizhevsky. We have an article about him on CRI, but this one has much more details of his life. How the Sun Affects our Minds. One of the most important conclusions is Chizhevsky’s discovery went beyond periodicities and cycles, for he had uncovered a sobering truth about the human condition: we are not completely in charge of our own destiny. I would go further and say that we are not at all in charge. The solar wind comes past the earth at about 300 to 700 kilometers per second and fluctuates dramatically. This causes the earth’s electromagnetic field to ring like wind chimes in the wind. The natural frequency of the earth’s electromagnetic field is 8 cycles per second, called the Schumann resonance as that is the rate for electromagnetic waves to travel around the earth. That frequency is right in the middle of human brain wave frequencies so we can understand how the sun affects us. A few years ago my friend John Simpson gave me a copy of his data records of epileptic seizures that he had over the period January 2004 to June 2011. For each seizure he recorded whether it was grande mal or lesser seizure, which were recorded as 2 or 1 respectively. All other days were recorded as 0. 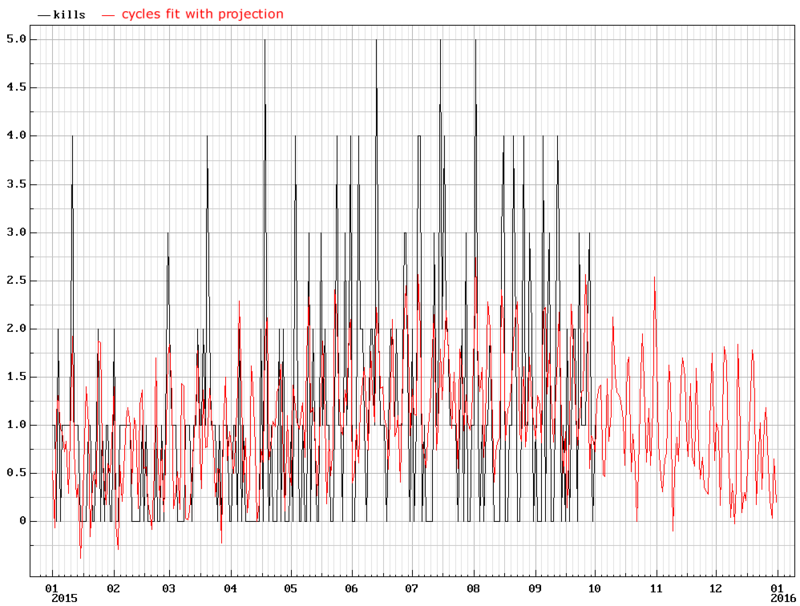 At the time I did some cycles analysis of his data and there were very significant cycles, and lots of them. Recently I asked him if I could put the information on Cycles Research Institute blog and he said yes. The figures in red are the cycles period which were significant at the 0.05 level. Probably many of these are not real, but many will be. The outstanding period is the 16.672 day one. It has p=0.000128 which means that such a cycle would be present only one time in 8,000 if the data were random. The cycles periods found do not generally correspond to any well known cycles periods such as solar or lunar. Perhaps the cluster around 7 days is related to the Sun because the Earth is hit by more solar wind particles typically every 7 days due to the Sun rotating. This would tend to suggest that the periods are mostly due to internal processes in John’s body. It is surprising that such a cycle could be very regular, and yet the 16.672 day cycle is so regular that the seizures are concentrated in half the cycle and especially in a few days, with one week of the cycle rather free of seizures. This graph is prepared by wrapping time in a loop every 16.672 days as it were, so in 2004, January 1 is on the left through to 17th on the right. The 18th will appear about 1/3 of the way between 1 and 2 January and subsequent days at one day interval. After each multiple of 16.672 days the data is re-entered from the left. I call this type of analysis “wrap”. It is useful for seeing the average shape of a cycle. 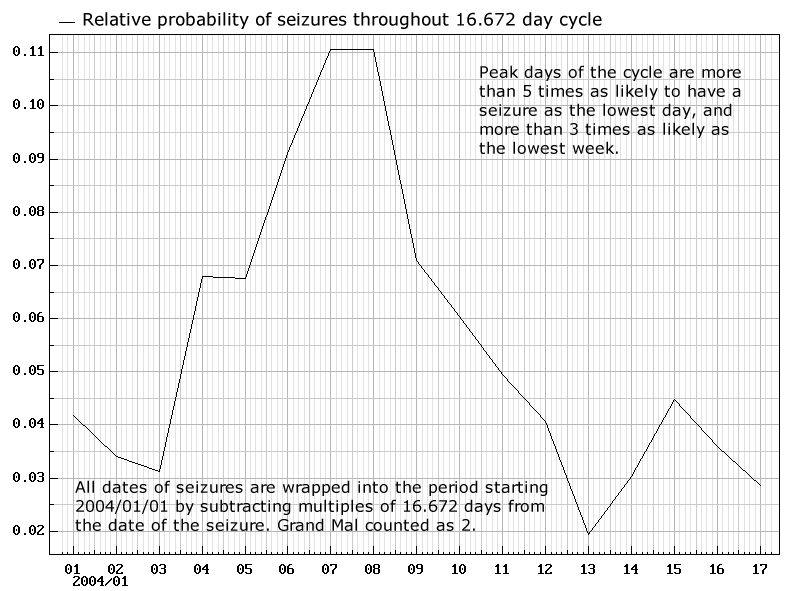 The scale at the left is the probability of a seizure on that day of the cycle, without grand mal counted as two. 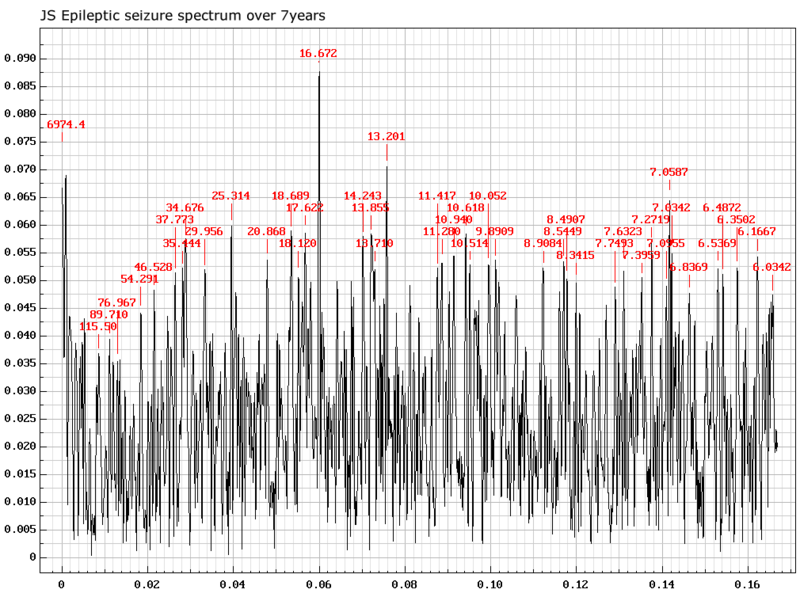 It can be seen that the peak days are over 5 times as likely to have seizures as the trough days, and more than 3 times as likely as the whole trough week. A search of the internet for epilepsy cycles brings up many pages. For women about 10% to 12% have a form called catamenial epilepsy which follows the hormonal cycle. No monthly cycle is noticed for men. It is thought that hormones play some part, but this is not fully understood. It is reported that seizures are often clustered in time, there being a burst in a short period and then none for a while. Such distribution will make cycles appear to be more significant than they are, or even make them appear when they are not. However that is not true of the dominant cycle here. I found a report of one young man having a cycle of 10-12 days in seizure clusters. That is not so greatly different from John’s. He did not mention to me that he had noticed any periodicity. It may be that the seizures are not happening every cycle so the intervals might be 17, 33, 17, 50, … days which would not be obviously apparent. John reports to me that he no longer has any grande mal and no longer keeps a log. Thank you for sharing your data with us John. In July 2014 I was contacted by Anirban Bandyopadhyay and we had a chat on skype. He told me that he had found my web site late one evening and that he had then spent 18 hours without food or sleep reading it all and watching my Youtube videos. Quite clearly we have something in common in our way of looking at the world as nested rhythms that pervade the Universe and give form to everything from the largest to the smallest. Today I found this video of his done last year and we see his enthusiasm and the way he sees things connected. Now I want to go to India or Japan or wherever he and his team are and work together on these issues. Although I had been somewhat interested in cycles before 1978, that was the year when I began doing economic modelling on a computer and some cycles just jumped out at me uninvited, and a long time serious interest in cycles began. I did work at that time for a number of Corporations, both large ones and small ones that were about to become large. I developed my own techniques for doing this, and eventually became convinced that this method is better than the methods used by many economists. This study was performed at a time when the NZ economy was not an open one and some corporations wanted to predict possible future changes in the exchange rate, changes in interest rates and in inflation. Data were gathered for the last 44 years and included anything related to the New Zealand economy:- import and export prices and volumes by various major categories; stocks of major NZ production items; terms of trade; share prices; several price and inflation indices; a variety of demographic data; births, deaths and marriages; mortgages and land and building prices and transfers; wages. The analysis used the base variables and also the annual rate of change of them because that is often what is desired to be predicted. All these variable were processed by a method known as factor analysis. What this does is to take many variables and reduce them to a much smaller number that still contains the essence of the original, in that the original data is very largely explained as each item being affected by several of these factors, with the balance taken as being to some extent noise. In this study, 9 independent (that is uncorrelated) factors were extracted and this report shows graphs of these. When considering any of the original variables or its rate of exchange, nearly all of the variables can be well explained as the sum of a combination of the factors with various loadings. It can be seen that the first two factors are rather slow moving ones that show the general state of the economy and it is suggested that these are related to the Kondratieff cycle which is recognised as being about 53 years. Factors 3 and 4 show a moderately regular cycle with a period varying between 3 and 4 years. These two variables are related in the same way that a sine and cosine wave are (or an electric and magnetic field for that matter) with factor 4 being a reasonable measure of the rate of change of factor 3 and factor 3 being a reasonable measure of the negative rate of change of factor 4. These two together are what is generally called the business cycle. Factor 6 shows a quite regular cycle of close to 3 years although it shows two periods of heightened amplitude around 1957-60 and 1972-74. These two periods correspond to brief periods (3 years each) when the country had Labour governments in between longer periods of National government. However the timing allows the conclusion that the cause of the cycle was not the change in government but perhaps the other way around. The other factors are not so clearly defined as cycles, although there is some presence of cyclical activity. They are less well defined, but have specific meanings in terms of which variables they correlate with. In order to try and predict future economic conditions, multiple regression equations were found that use the 9 factors to predict each of the factors in turn from the previous years values for those factors. This works particularly well for factors 3 and 4 because, as mentioned, each variable is closely related to the rate of change of the other. Before trying to predict the future, it is always best to try and predict the past to see if the method is reasonably sound. So here are two test runs of the method compared to what actually happened. One test was started in 1960 and the other in 1973. The choice of 1973 was made because the so-called oil shock happened in 1974 and lead to major disruption in world prices and economies, and is considered to have been a random rather than a predictable event. However the test shows that the regression equations predict the big swing in factor 3, actually slightly over-estimating it. Factor 3 is negatively correlated with many economic variables and so goes up when the economy crashes – the things related to it are terms of trade and export prices and volumes. NZ is harder hit by this factor than most countries. In most cases the predictions are moderately accurate for about 5 years ahead after which the forecasts become a bit sterile compared to the economic movements that actually happen. The next step is to use the data to make real predictions about the future. It has been said that prediction is a difficult business, especially about the future. These forecasts were supplied to several corporations and also I gave a talk at the NZ Statistical Association Conference. It was well received, except that several economists had some criticisms. They told me that the long cycle that seemed to exist in factor 1 (and perhaps 2) was called the Kondratieff cycle and also named another cycle or two and then told me that these cycles did not exist. I was very puzzled as to why cycles that didn’t exist appeared in my data and why that had been given names! However participants other than economists said that some of the other cycles were exactly what they experienced in their own areas of study. These predicted values for the factors are then used to work backwards to the original variables and give the clients what they wanted to know. My prediction of inflation continuing at a level of around 15% for at least 5 years was very markedly different from NZ Reserve Bank and other economists who were predicting a rapid decline towards 5% in 3 or 4 years time. My prediction was the one that was right. In my report to my client, I was able to make quite an accurate prediction of the share market for the next few years and to state that there would be no more devaluations of the NZ$ as there had been several in the previous few years. There were no errors in my forecasts. This method of reducing economic variables to a small number of factors that still contains the essence of the data is a valuable method that overcomes several serious problems in economic modelling. Firstly, there is usually insufficient historical data and models become over specified and mathematically are not sound. The use of factors also removes noise and the factors are much crisper and cleaner data. There are other methods that are also better than traditional modelling methods, such as Box-Jenkins ARIMA models etc. These methods are mathematically based and assume no economic knowledge and they work. The economic understanding models are generally less accurate. I have not compared my method to Box-Jenkins, which uses only one variable to,predict any variable — itself! I suspect that this method would allow an improvement on Box-Jenkins, because in the case of factors like 3 and 4, they do show that there is momentum in the economy that moves from one variable to another. For 4 years from early 2007 until late 2010, Ray Tomes ran a blog called “Wobbly Universe” on his personal web site. With software changes that blog stopped working. Over the coming weeks or months these old articles will be reposted to CRI blog.